If you are reading this article then you are probably aware of the Yellowstone eruption threat to civilization. If not then here it is in one sentence: Underneath Yellowstone park is a volcano so big that if it blows it will likely take out half of the US before casting ash plumes that will block out the sun and bring the world into a decade long perpetual winter. The bit most people enjoy hearing the least is that (according to many sources across the Internet) the volcano goes off every 600,000 years, and it is now 640,000 years since it last blew. 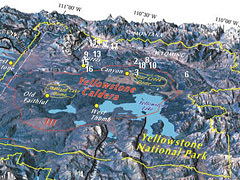 This means that we are 40,000 years past due the next big Yellowstone eruption. Its stuff like this that puts the overdue credit card bill into perspective, isn’t it?! Many of us lead a life in which we often feel like we are “fighting for survival,” when, in truth, we ain’t seen nothing yet. So when the big one comes, what should we do? 1 – Get away from the North-West! When Yellowstone blows, you really don’t want to be in Wyoming or any of the states that border it! Am I telling you move away from your beautiful mountain home in Colorado just because there might be a huge explosion sometime in the future? Well, yes I am! But as I know that is completely ludicrous and only completely loopy people are going to do that, I will move onto the next, more useful point. 2 – Watch out for that ash! No matter where you live in the US, the big immediate danger (if you haven’t been blown to smithereens) will be the volcanic ash. There will so much of the stuff, that it will pile up on roofs to the extent that millions of buildings would be likely to collapse. So, particularly if it has a flat roof, get out of you building! At the same time, you should really stay in your building and close all the windows, as breathing in that stuff will do you no good at all! So either way you’re screwed. Really the best thing would be for you to have a stock of high quality masks at your disposal. 3 – Get rich and buy a place in a shelter! If you are really rich there are a variety of products on the market now for just these kind of occasions. If you’ve seen 2012, you’ll know what I’m talking about. You could be one of the lucky few to have a place in a specially designed shelter for up to five years after the explosion. Let’s just hope you get on with your room mates…. Posted on May 6th under Natural Disasters.